Let us pick this deceptive turd apart, shall we. It “IS” “Rather” simple to do. For a guy that doesn’t know what a rich man is, how in the hell is he going to be able to know what a poor man is? Eh? Can JRE pull off a JFK, or an RFK (asks Politico chief political writer Mike Allen, who is sharing guestblogging duties while Ben is on vacation)? John Edwards plans to announce Monday that he’ll take a break from fund-raising and campaigning in early-voting states next week for a three-day, eight-state, 12-city “Road to One America” tour aimed at calling attention to poverty in the deep South, the Mississippi Delta, Appalachia and the Rust Belt. The campaign points out that none of the states he’ll visit has an early 2008 primary, and says Edwards won’t be doing rallies. Edwards makes me sick. Not as sick as Hillary does but sick just the same. The Double Standard is all so telling and obvious but the dumb and dumber flock to him like a cockroach to a bug-zapper. Edwards pays $400 for a haircut, his house has more square footage than most Central American Counties, his “carbon footprint” is larger than the eruption of Mount Vesuvius, his last 3 jobs were medical malpractice attorney (ambulance chaser), U.S Senator and hedge fund manager, he owns at least one of those Two Americas, and he gets the “college rate” of $55K to speak about poverty. Does anyone see the Double Standard here, besides me? What if, Edwards, the man that knows not what a rich man is, gets in the faces of the down trodden and tells them that they CAN rise above their circumstances, JUST LIKE HE DID and that the poor need NOT depend upon government to get them (the poor) out of their personal quagmires? How about Edwards tells them to pull themselves up by their OWN bootstraps, apply themselves and bulldoze their way to the top…like Edwards did? How about that? Wouldn’t THAT be a novel idea? Wouldn’t THAT be a worthy and noble cause? The photogenic swing is reminiscent of John F. Kennedy’s repeated coal-country campaigning before the West Virginia primary of 1960. His overwhelming victory ended Catholicism as an issue in the campaign and brought national attention to Appalachian poverty. Twenty-eight years later, Massachusetts Gov. Michael S. Dukakis donned a hard hat and overalls for an hour-long tour of a West Virginia coal mine. And Dukakis LOST big time and it sent his wife into the “clinic” for a spell due to utter humiliation when Ronaldus Maximus TROUNCED the Double Standard Dukakis machine in a landslide this country has only seen two of…both of them due to RWR!! “By telling their stories to the rest of the nation, the tour will attempt to shed light on the new faces of poverty in America,” the Edwards campaign says in an announcement document. The former U.S. senator from North Carolina has a plan for “ending poverty in America within a generation” that includes an increase in the minimum wage, investments in rural community colleges, creation of 1 million short-term “stepping stone” jobs, and a program to encourage responsible fatherhood and fight teen pregnancy. Or, how about if Edwards, if he REALLY cares about the poor, and he believes that everyone BUT his kind (the rich Leftinistra) should give up what they have and give to them what don’t have, freely gives HIS OWN DAMN MONEY to the poor and down trodden? Wouldn’t THAT mean something? Actions speak louder than words, Oh Mr I Don’t Know What A Rich Man “IS”!! Moron. Edwards has been putting a new emphasis on his message of economic fairness as a way to make himself more than the anti-war candidate. He also wants to mop up union endorsements and get more traction among lower-income, working voters without a college education. But he’s so wealthy that he has struggled to mold a populist image. Economic fairness…that’s one of those buzz words, right? That’s one of those “sound good” terms, right? But, what the hell does it mean? NOTHING! That’s what it means. He wants BIG LABOR UNION DOLLARS (will he give it to the poor?) to win an election by catering (pandering) to those with seemingly little hope because they rely on Big Brother and Big Brother has NO intentions of helping. Big Brother relies on the poor to keep control of the poor. That’s how socialism takes root. Stop-by-stop information (along with a snide aside and an explanation of the RFK reference) after the jump. Edwards will start next Sunday, July 15, with a walking tour of the Lower Ninth Ward in New Orleans. The three-day tour will officially begin the next day in New Orleans with a town hall in conjunction with ABC’s “Good Morning America,” where he’ll kick off the day’s theme of “Rewarding Work and Ending Poverty in America.” Then he’ll head to Canton, Miss. ; Marks, Miss. ; Marianna, Ark. ; and Memphis, Tenn., where he’ll give the first of two speeches. Ending poverty. Engels and Marx promised that Utopian impossibility. So. Edwards is a socialist as well. These trolls out themselves on a regular basis. On Tuesday, July 16, he’ll take his theme of “Strengthening Neighborhoods and Cities Rising” to Cleveland; Youngstown, Ohio, where he’ll give the second speech; and Pittsburgh. The finale will be Wednesday, July, 18, with a theme of “Restoring Hope to Rural America.” He’ll stop in isolated southwest Virginia, then will end in Whitesburg, Ky., and Prestonsburg, Ky. That’s the same Prestonsburg that was the final public stop by Robert F. Kennedy in 1968 on HIS iconic poverty tour. P.S. In Maureen Dowd’s essential Sunday account of an interview with Edwards about his tastes in books, music, TV and actors (“Phantom At The Opera: He likes his culture with a drawl”), print she quotes the former senator as saying: “Elizabeth thinks the two rules you always use in politics are: Don’t dance. And don’t wear hats.” Ms. Dowd adds: “Especially not if you’ve got such a fabulous haircut to show off.” And we might add: Tough to stick to in coal country. UPDATE: In response to a comment below from reader SRB, who challenged the use of “overwhelming,” here are the 1960 West Virginia primary results: 60.8 percent for Kennedy, to 39.2 percent for Hubert H. Humphrey of Minnesota. See the whole chart here. The general election, probably what SRB was thinking of, was one of the closest in history — 49.7 percent for Kennedy to 49.5 percent for one Richard Milhous Nixon of California. The plan Mr. Edwards presented yesterday – which he dubbed “A Strategy to Shut Down Terrorists and Stop Terrorism Before It Starts” – calls for a 10,000-person “Marshall Corps” to deal with issues ranging from worldwide poverty and economic development to clean drinking water and micro-lending. He said investing in those areas would shore up weak nations and help ensure that terrorism does not take root there. That, he said, would allow the country to stop potential terrorists before they even join the ranks. all of the above listed would prevent activation of potential terrorists. Islamic terrorism is a grievance driven; resulting from economic & social conditions. rapidly escalating oil revenues in the region? Have those factors prevented terrorism? Have they reduced terrorism? And exactly how will more of the same have any beneficial effect? Together now, lets take a firm grip on Mr. Edward’s shoulders and pull his head out of the orifice where it is stuck. Careful, don’t muss his hair. Usama bin Ladin is a multi millionaire, the son of a super rich construction contractor. Ayman al-Zawahiri is a pediatrician, able to earn plenty of money in his profession. Sheik Khalid Mohammed is a western trained engineer. Many of the splodydopes are law & medicine students. Get a Godblessed clue!!! Islamic terrorism does not result from poverty, deprivation, etc. What does cause it? Volume 1, Book 7, Number 331: 1. Allah made me victorious by awe, (by His frightening my enemies) for a distance of one month’s journey. To what does Presidential Aspirant John Edwards attribute Islamic terrorism? Do the leaders of al-Qaeda and the splodydopes fit that pattern? What did Allah say about terror? What did Muhammad say about terror? What did Allah say about fighting? What did Muhammad say about fighting? Whom are Muslims commanded to obey? Whom are Muslims commanded to emulate? The bottom line: Islamic terrorism results from belief in and obedience to orthodox Islamic doctrine, not economic nor social conditions. Ending poverty will not end terrorism. Clean water & modern plumbing/sanitation will not end terrorism. Education will not end terrorism. Only eradicating Islam from the face of the earth will end terrorism. If you comprehend the fatal fact, demand that aspirants to the Presidency and other offices quit lying about Jihad & terrorism. Disrespectfully demand that they cease using qualifiers in conjunction with Islam. The problem is standard, orthodox, off the shelf Islam, not some mythical ‘radicalism’, ‘fundamentalism’ nor ‘extremism’. Copy this article and post it in your own blog or web site. Email it to your friends and relatives. If you don’t comprehend the fatal fact; if you believe Mr. Edwards, then burn your voter registration card immediately; you’re too stupid to be allowed to vote. I guess that because it was only in the planning stages that the threats don’t exist. The New York Slimes. Such patriots. The FBI announced Saturday three Muslim men have been arrested for plotting to blow up fuel tanks and pipelines at John F. Kennedy International Airport. The New York Times ran a story about the plot in Sunday’s paper. On page 30. The front page was reserved for a sympathetic story about Omar Ahmed Khadr, a suspected al Qaida terrorist being held at Guantanamo Bay. We learned early in that story that Mr. Khadr was only 15 when he was arrested in Afghanistan in 2002; that he is “nearly blind in one eye” from the firefight in which he killed one American soldier and maimed another, and that he “doesn’t trust Americans.” Only much deeper in the story does reporter William Glaberson mention that young Mr. Khadr’s father was a senior deputy to Osama bin Laden. Friggin’ moron. This was swiped from Wake Up Americans. Yes, I wonder if Edwards will publish those photos too. So, Johnny Boy, happy now? You got your protests and your name will now be forever associated with burning flags and swastikas placed on our brave veterans’ graves. This guy is a LOSER!!! This moron that would be CIC encourages this kind of disrespectful and UNAMERICAN and UNPATRIOTIC activity. NEW YORK (AP) – Democrat John Edwards Wednesday repudiated the notion that there is a “global war on terror,” calling it an ideological doctrine advanced by the Bush administration that has strained American military resources and emboldened terrorists.In a defense policy speech he planned to deliver at the Council on Foreign Relations, Edwards called the war on terror a “bumper sticker” slogan Bush had used to justify everything from abuses at the Abu Ghraib prison to the invasion of Iraq. In the first presidential debate last month in South Carolina, Edwards was one of four Democrats—including Delaware Sen. Joe Biden, Ohio Rep. Dennis Kucinich and former Alaska Sen. Mike Gravel—who said they did not believe there was a global war on terror. Front-runners Hillary Rodham Clinton and Barack Obama indicated that they did. Edwards outlined several steps he said he would pursue as president to strengthen the military, including using force only to pursue essential national security missions, improve civilian-military relations, and root out mismanagement at the Pentagon. He said he would created a “national security budget” to include the activities of several agencies, including the Pentagon, Energy Department, and Homeland Security. He also said he would boost the budget for military recruiting. But Edwards saved his toughest words for the Bush administration, whom he accused of engaging in wrongheaded military adventures while abandoning U.S. “moral leadership” in the world. Because of the administration’s poor stewardship, Edwards said troops were exhausted, overworked, and potentially ill-prepared for future threats. “Leading the military out of the wreckage left by the poor civilian leadership of this administration will be the single most important duty of the next commander in chief,” Edwards said. Anticipating the speech, the Republican National Committee sent out a research document titled “Edwards’ Troop Profiteering,” noting that his campaign routinely solicits donations to help Edwards pursue his anti-war efforts. edwards has just received the Darwinian Moron Award. Evidently, this idiot that would be the next POTUS is yet another example of the Idiot Class of Society At Large. Perhaps edwards should study some more and read up on the enemies of our country (unless those enemies are his friends). I have forwarded the following post to the edwards dungeon of stupidity (his campaign orifice) and y’all can read the same post as well. It is a compilation of guest authors on my blog entitled Studies in Islam (Jihadism). Just goes to show how demented the pretty-boy-floyd of the dnc is. Families United is a grassroots coalition of Gold Star and Blue Star families including some with loved ones in harm’s way, Veterans, and Americans who share a deep appreciation for our men and women in uniform and support them in their efforts to make America safer by allowing them to complete their mission. Our troops are depending on your support. Please read and sign the petition and share it with everyone you know today. Read the latest news about Families United and our members. Meet our families and read their courageous stories. Request a Families United speaker for your next event. ATTENTION PATRIOTS!! edwards Calls For Protests on Memorial Day!! In a feigned “patriotic” message, edwards the pretty-haired “boy”, kerry’s “good buddy”, has called for antiwar activists to “support the troops” while protesting the war. The two actions are contrary to each other and is proof positive that edwards and ilk are completely brain-dead. MAJOR HAT TIP to Lew!! Spread the word of outrage!! 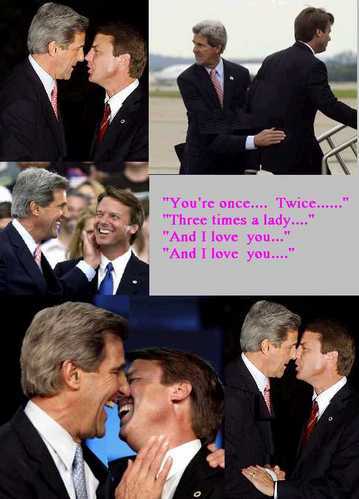 In yet another attempt at seeing to Support the Troops while undermining them, Democrat party hopeful and former failed vice-presidential candidate, ‘silky’ John Edwards, better known as the “Breck Girl,” has launched a new web site, Support the troops. End the war. Edwards, before he was elected to the Senate to represent North Carolina, was known as a pretty slick lawyer well practiced in glib speech. His talent of misleading juries into awarding clients, and him self, huge multi-million dollar judgments is put into practice on his new venture as he skillfully blends a feigned Support for the Troops with his anti-war message. In a shameless show of obfuscation, he posts links to real and honest Troop Supporters Anysoldier.com, Operation Gratitude and Troopcarepackage.com. He is actually calling for anti-war displays at Memorial Day Activities! How dishonorable is that to our Veterans who have sacrificed much to keep America free? Most telling in the Democrat party’s anti-America stance is that with all their calls for withdrawing the Troops (only from Iraq, mind you) is that nowhere do we hear or see them calling for our nations Police Forces to withdraw from high crime areas of our own major cities. Of course, there is no political gain in making that call. If they honestly were that concerned over the Troops and this war, they would pass a bill defunding the war immediately, in effect surrendering to terrorism and force the Troops home. Of course, that places the failure square on their shoulders. Don’t fall for a slick lawyers ploy. Support for the Troops is secondary to his desire for campaign material and adding to his personal fortune, at our expense. UPDATE: I am not the only one outraged over this. Keepin’ It Real has expressed outrage as well. 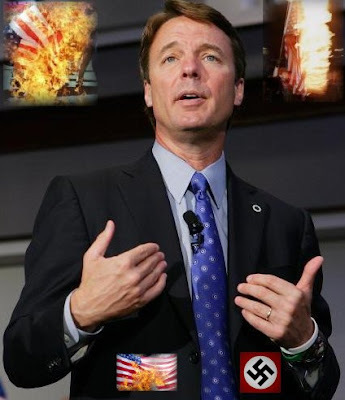 “Democratic presidential candidate John Edwards is calling on his supporters to turn this year’s Memorial Day into a day of antiwar activism, saying that the best way to honor the troops is to demand an end to the Iraq war,” the Washington Post reports. Edwards, who voted for the war, has set up a Web site for his effort, supportthetroopsendthewar.com. Andrew Sullivan has observed of Edwards, “He’s pretty, he has flowing locks, he’s young-looking.” But as lovely as Edwards may be on the outside, it is ugly to try to turn a solemn day honoring those who died in the service of their country into a political stunt. What’ll he think of next, turning Christmas into a day of pro-abortion activism?